Can I just say how easy it was ordering my pantry products online? I was also impressed with Faithful to Nature’s customer service when one of the items I chose was out of stock – they kept me updated on how the order was progressing and contacted me as soon as everything was ready. These days it is a nice surprise when a company tells you they will give you a call about something, and then actually do! 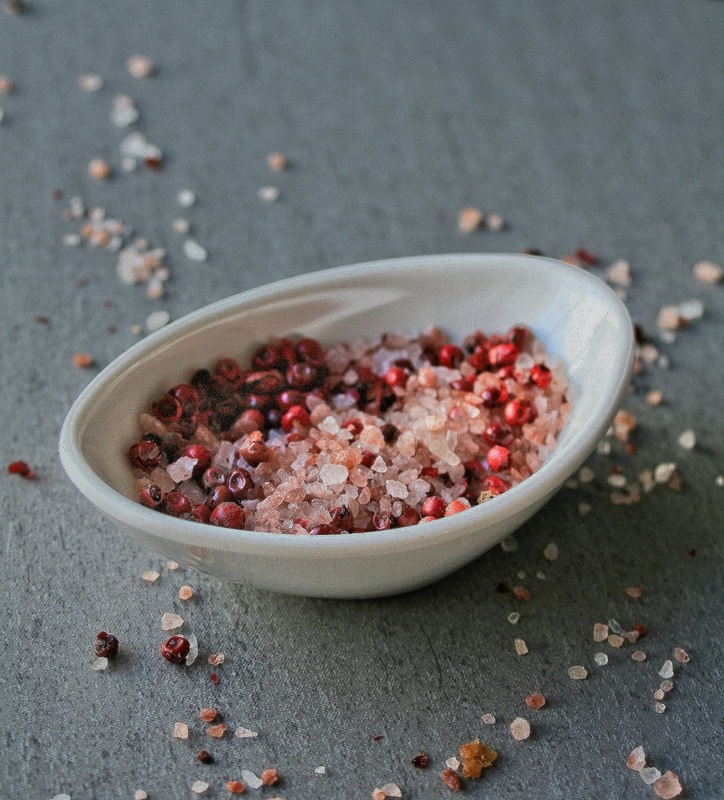 How pretty is this pink salt and peppercorn mix? Every day I cook for my little family of four and I am always trying to think of ways to incorporate healthy veggies into our meals. This can be especially challenging with little ones – they enjoy some vegetables but the green ones are usually the least popular (am I right parents?). 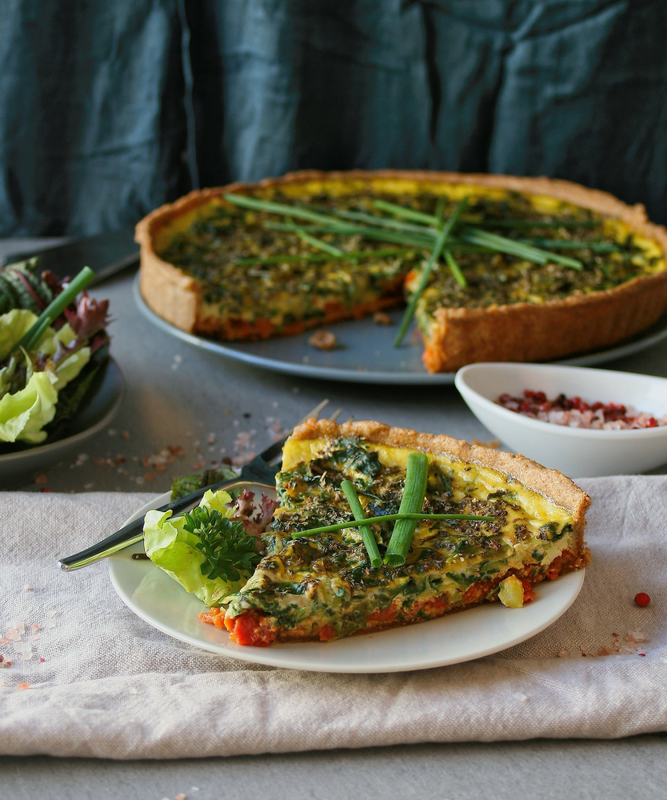 My children were excited about trying this spring vegetable tart though and it was a good way to get them to eat the greens they tend to avoid. There are a couple of components to this recipe, but I have tried to keep everything as easy and fiddle free as possible. This was my first time working with spelt flour and I made an easy spelt shortcrust for the base of the tart. It is a delicious and wholesome pastry that can be made in minutes in a food processor. It is also quite a robust and forgiving pastry – ideal for when you need to get dinner on the table and do not have time for delicate pastry work. The pesto is also made in the food processor, and adds a vibrant burst of flavour to the tart. Check out the #faithfulfood hashtag on Twitter, Instagram and Facebook to see all the delicious dishes made by some of our very talented local food bloggers. 1.) To make the pastry: Put the spelt flour and butter in the food processor and whizz for a few seconds until the butter has been incorporated. Add the cold water and whizz for another few seconds. 2.) Tip the contents onto your work surface and press together into a dough. Add another few drops of water if the dough is too dry. Press into a disc, wrap in cling film and pop in the fridge while you prepare the pesto and veggie filling. 3.) To make the pesto: put the dried tomatoes in a small bowl. Cover with the boiling water and leave to stand for 15 minutes. Place the sesame seeds in a small frying pan over a medium heat. Toast the sesame seeds until golden brown. 4.) Drain the tomatoes. Put them in the food processor with the toasted sesame seeds, olive oil, garlic, paprika and onion powder. Add a grinding of salt and pepper. Whizz for a minute or two until everything is combined and you have a thick pesto. Set aside. 5.) Melt the butter in a large frying pan. Fry the grated courgettes and chopped leek for a few minutes to soften. Add the chard and stir on the heat for a few minutes to wilt. Take the pan off the heat and stir in the chives and a grinding of salt and pepper. 6.) Preheat your oven to 180°C and grease a 24cm tart tin. Dust your work surface with a little spelt flour and roll the pastry to a thickness of 3-4mm. Carefully lift the pastry into the dish and press into the edges. Cut the excess pastry away from the edges. Place a piece of crumpled baking paper over the pastry and fill with baking/dried beans. Bake the pastry for 10 minutes. Remove the beans and paper and bake for a further 10 minutes or until the pastry is just cooked. 7.) 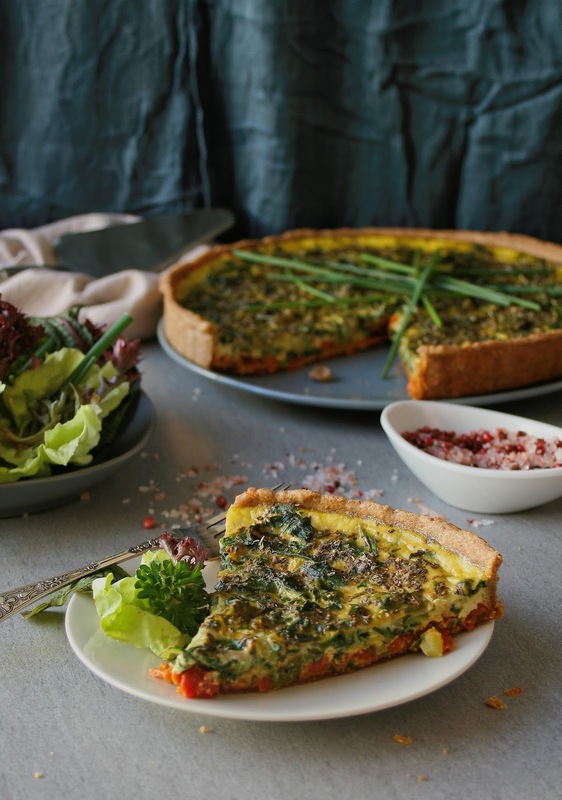 Spread the tomato pesto onto the base of the tart. Arrange the vegetable mixture on top in an even layer. Whisk the eggs and almond milk together until combined. Pour over the vegetables, then sprinkle the Italian herbs over the top. 8.) Carefully transfer the tart to the oven and bake for 35 minutes, or until the filling has set. 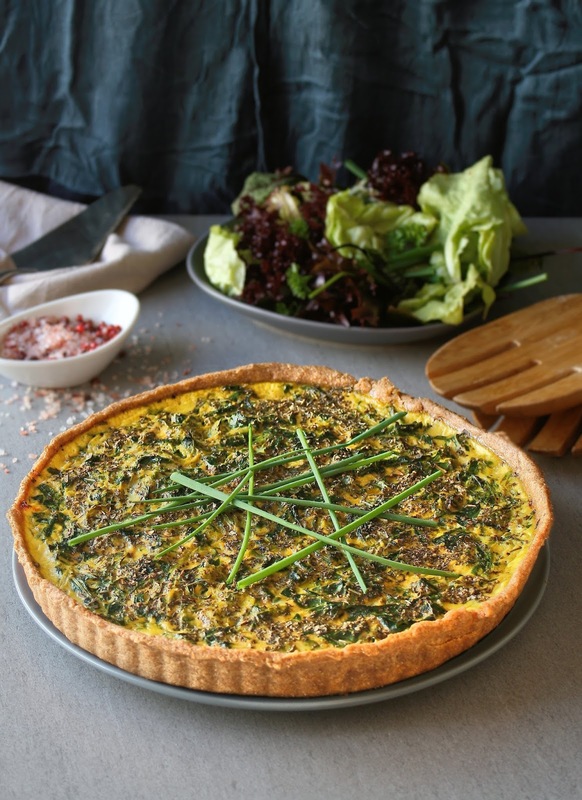 Allow the tart to cool for a few minutes, then serve with a crunchy, organic herb salad. 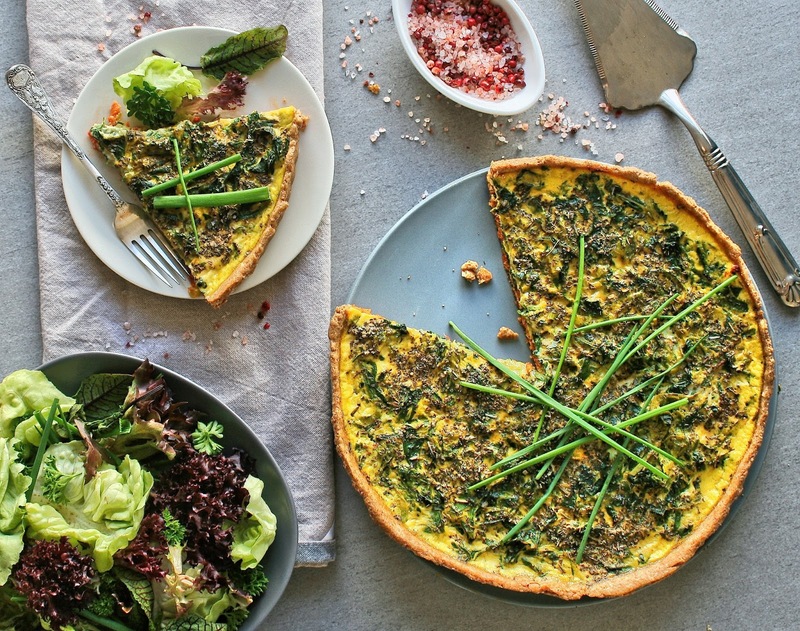 Make ahead tip – the pastry, pesto and vegetables can be prepared a few hours ahead of time, simply store them in the fridge. Assemble the tart and bake when required. Wow, this looks amazing Teresa! Scrumptious recipe Teresa! I love baking with spelt but haven't tried a pastry case yet. Amazing how creative one has to be to get the whole family to eat their greens. Thank you for your kind comment Vanessa! This looks so yummy. what size eggs do you use?